Cable’s arrival pretty much marked the end of the New Mutants. The book would go on for a bit longer, and the team name is still hanging on – but the original concept of “a group of kids growing up while learning to deal with each other, their powers, incipient adulthood, and the often hostile marvel universe outside” fell away in favor of the usual “superhuman strike team” with a side-dose of “mysterious mentor with secret goals” AND “grizzled veteran sergeant takes command”. Now the “kids” idea had been subverted from very early on – basing things in the X-Mansion made it impossible to effectively isolate the New Mutants from the semi-permanent warfare of the rest of the marvel universe – but it had heavily influenced things. That would no longer be the case, the group of friends turned into a full-blown military unit, and a number of the more emotionally awkward, childish, or socially-focused characters were quickly written out. Cable was REALLY popular for a while, but I’ve never quite been able to tell from the artwork if he was a human character or an unusually mobile fortification. While it varied with the artist, people’s bodies are just not designed to look like walls – or to have arms and thighs big enough to smuggle multiple normal people in – and his was often drawn that way. The fact that he was a Mutant / Psychic / Cyborg / Military Guy / Time Traveler (who changed his parents lives well before he was born) / Techno-Organic Virus Victim / Refugee / User of Super-Advanced Alien Technology / Black Sheep of the Summers Clan / Mastermind / Gadgeteer / Heir to the Goblin Queen / Alternate-Dimensional visitor / Mentor with more guns and gadgets than you could squeeze into a truck and wildly varying levels of power and foreknowledge / Destined Messiah / Resistance Leader / Evil Clone Victim / Host to a Celestial AI would certainly help make a case for their being more than one guy in there. Tongue-in-cheek humor aside, Cable really did have enough origins and power sources for three or four hero teams all by himself. Plenty of characters have gotten along with just being a Cyborg or a Time Traveler with some gadgets, or having a single mutant power. Throwing in all that suff was just overkill. Perhaps fortunately, most of the weird stuff rarely came up. Most of the time he was basically just a mysterious tough-as-hell mercenary with lots and LOTS of guns and a big reputation – even if it was developed entirely in retcons. And then we come to his Techno-organic Virus, which was killing him (although, apparently, it also raises the dead), although he was holding it back with his telekinesis and/or telepathy, which was why his mutant powers were so weak. When he had to use his powers the virus tended to advance, when he could focus on the virus again he could push it back… Wait, what? A virus isn’t a spring; an infection gets WEAKER as you reduce the affected area, not more able to resist you. So if he could “push it back” and stabilize it, why couldn’t he cure it? And how is this related to the almost-identical seeming Transmode virus? And since it had affected and enhanced every cell of his body, and his entire skeleton, his organs, and his central nervous system… wasn’t it already everywhere? And he could reconfigure his cybrenetics with his mind? Oh never mind. There’s just no getting around it; even by comic book logic there are parts of Cables existence that make no sense – so I’ll go with that. As with many of the more experienced, complicated, or higher-powered characters, THIS build only covers a portion of his abilities. It does offer a reasonable (for Cable anyway) set of base attributes though. “Cable”, A.K.A. Nathan Christopher Charles Summers Dayspring Askani’son. Basic Attributes: Str 16 (+4 Eq +6 Enh = 26), Int 12 (+6 Enh +2 Eq = 20), Wis 12 (+6 Enh +2 Level = 20), Con 14 (+6 Enh = 20), Dex 15 (+6 Enh +2 Eq = 23), and Chr 12 (+2 Human +6 Enh = 20). 25-Point Pathfinder Point Buy. Augmented Bonus, adds (Con Mod) to (Int Mod) for Skills, Specialized and Corrupted for Triple Effect / Rune Magic Only, Telepathy, Telekinesis, and Transmutation Only (6 CP). This is INCREDIBLY cheesy. Tripling the effect of Augmented Bonus works well in a superhero setting, and for powers that are limited otherwise – but I’d be very cautious in allowing it in a normal game. Finesse: May use Intimidation in place of Deception, Specialized and Corrupted/only to use Intimidate to Feint in combat (2 CP). Mastery (6 CP): Mastery allows you to select (Int Mod x 3, 3 Minimum) skills in which you can “take 10″ even under stress. With an Int Mod of +5 and only thirteen skills which are normally ever rolled, Cable may simply “take 10″ on any of them. Face: Goggles of Foefinding (2500 GP): Ignore your targets Cover bonuses to AC. Head: Scout’s Headband (3400 GP)” +2 to Perception, 3 Charges/Day. He usually uses Mana to augment those charges. Ring of Bodysliding: Greater Teleport (Spell Level Seven x Caster Level Thirteen x 1800 GP Unlimited-Use Use Activated x.2 (one use/day) = 32,760 GP). He usually uses Mana to power this. Shoulders: Banner Of The Storm’s Eye (15,000 GP). Torso: +4 Vest of Resistance (16,000 GP). Boost Armor with Gravlight (Max Dex +1, Armor Check -2), Improved Defense III (+3 Armor), and Increased Range of Motion I (+1 Max Dex), Rigid (+1 Armor Check Penalty). Total +7 (+3 Improved Defense +1 Magic = 11) Armor, +4 Max Dex (+1 IRoM, +1 Nimbleness = +6), Armor Penalty 3 (+1 Rigid -2 Gravlight -2 Nimbleness = 0), Speed +10, +4 Str, +2 Reflex Saves. (1000 GP). Neural Computer Link (450 GP). Computer Use and Research checks become free actions. Cyberware: Twitchfiber I (+2 Dex, Miniaturized/does not count against implant limit, 175 GP). Net Future Tech: 1895 GP. Sadly, for all of Cable’s incredible potential power – Level Eight Effects at Caster Level Sixteen for Telepathy and Telekinesis and Level Six Effects at Caster Level Twelve for Transformation – he can only spare two points of mana a round to actually use those abilities, effectively restricting him to second level effects with relatively low caps. If he should somehow be reborn as a natural part of the timeline his power would soon grow to immense levels – at least until he started causing paradoxes again. It’s hard to believe that he would manage to kick the time-travel habit. Askani Kung Fu Techniques: Defenses +1, Attack +1, Strike, Weapon Kata (Cyberweapons), Mind Like Moon, Prone Combat, Combat Reflexes, and Inner Strength. Honestly, I can’t see Cable not knowing a martial art. On the other hand, I haven’t really looked at the character in many years, and about all I can recall seeing him use are weapons and powers. Ergo, this is pretty generic. Speak Language +5 (English, Spanish, Chinese, French, German, Askani, other future tongues). Paradoxical Existence: Additional Form of Inherent Magic: Reality Editing, Specialized and Corrupted for Increased Effect; only to maintain his own awesome existence (6 CP). Cable is a walking time paradox. He altered his own parents lives before he was conceived without splitting the timeline. He has stopped the future he grew up and trained in from coming to pass and yet remains. He is infected by a virus that makes no sense and must constantly keep it under control with powers wholly unsuited to the task but cannot eradicate it. His history is retroactive and entirely of his own invention, involving people who never before existed, He should be dead, has died, and yet lives. He SHOULD NOT and CANNOT be, but IS, and he doesn’t have enough accursed antediluvian blasphemous effulgent loathsome non-euclidian squamous tentacles to meet the qualifications for being a Lovecraftian blasphemy against all reality normally. Constantly telling reality to roll over and play dead that way takes a LOT of power. For Cable, maintaining his own existence is a Major (3 Mana) Reality Edit each and every round. This does, however, allow him to throw in a few extras – never running out of ammo, having unreasonable amounts of gear and weapons on him, bulking up or slimming down from moment to moment, and so on. For +1 Mana he can opt to “take 20″ on a save, maximize one of his attacks, ignore a minor condition (stunned, dazed, nauseated, etc), or automatically confirm a critical hit. For +2 Mana he can “take 20″ on an attack or check, take an extra action, minimize the damage from an attack on him, or shrug off most conditions (stunned, frightened, etc). Fortunately, none of this requires actions and can be done even if he’s unconscious or OUGHT to be dead. If, however, he fails to maintain his own existence… things start to go very wrong. His body may start to twist and distort, he can start rapidly losing hit points or otherwise weakening, or he can even start to fade out of existence – and it will take a lot of extra editing and general misery to get back to what passes for normal. Returning (6 CP): Cable is even more difficult to get rid of than most heroes, since unless you do something about all the time traveling he will just write his own death out of the timeline and pop up again sooner or later. Flashback: Reality Editing, Specialized and Corrupted (very limited applications) for Reduced Cost. Cable may spend Mana to temporarily insert minor details into his backstory. This does not count as an action (2 CP). For one Mana he gets to have made (IE: instantly make) a Gather Information check against an individual or organization – getting a capsule summary of their reputation on a success, adding in their general abilities at success +5, evaluating their comparative power level at success +10, and throwing in their usual tactics and current activities at success +15. For two Mana he can add “Oh, I learned how to do that” to his backstory for a little while, giving himself five effective ranks in a skill long enough for a single roll. For three Mana he can temporarily add a bit of history with someone (either a specific NPC or a general type of person who could plausibly be found in the vicinity) to his backstory. While this is always potentially useful, the description of that bit of history is up to the game master. Reality will usually put up with this a few times per session – but tends to bite back when pushed too far, and abruptly turning “Generic Guard #22″ into “Rivan the explosives expert who’s on a vendetta against you because you killed his youngest son in a prior adventure” isn’t always a good deal even if you get some useful information out of it and now know some of his weaknesses. Internal Systems: Empowerment, Specialized for Unlimited Use, Corrupted for Increased Cost, only to power his Scout’s Headband and Ring of Bodysliding enchantments with Mana (4 CP). Deep Reserve: 1d6 (4) Mana, Specialized and Corrupted/may only use one point per round to supplement his normal flow of Mana, may not use more than three points in any one-hour period, causes him to show ominous signs of existence failure, use requires a DC 15 Fortitude Save to avoid Fatigue (2 CP). Cable can occasionally push his limits a little bit – but it’s always a strain. Deep Reserve: Rite of Chi with +2 Bonus Uses, Specialized and Corrupted / only to refill the supplementary Mana pool purchased above, requires at least an hour of relative inactivity or meditation per die, cannot be used while Fatigued or Exhausted (3 CP). Man of Iron: Advanced Improved Augmented Bonus: Adds (Str Mod) to (Con Mod) for HP purposes (18 CP). Attack/Defense Expertise (BAB/AC, 6 CP). Attack/Effect Expertise (BAB/Effect, 6 CP). Human Shield: Opportunist: May take an attack for any target within normal movement range once per round, Specialized and Corrupted / the attack automatically hits the user and this will not work against attacks that do not require rolls to hit (2 CP). Quick Draw Artist: Reflex Training / may draw or change weapons as a free action (6 CP). Battle Hardened: Immunity/Fear (Common, Minor, Major, 6 CP). Sanctum (Graymalkin): Corrupted for Increased Effect; Cable doesn’t gain extra abilities in his sanctum, the sanctum itself has some abilities – and those can be pressed into service by someone else if they capture the place. Ergo, this is Corrupted for Increased Effect (6 CP, Graymalkin has 36 CP worth of abilities). Automated Systems: Leadership (Exotic, Constructs), Specialized/only exotic constructs (6 CP).Graymalkin comes with a crew of maintenance/repair/light security robots, various automated systems that deliver items and provide small services, and “Professor” – a fifth level AI who operates the place. Onboard Manufacturing: Equipage, with Purchasing and Returns. Specialized and Corrupted for Reduced Cost: technological items only, minor modifications are possible but relevant designs must be available, may require hours or days depending on the scale of the order (6 CP). Onboard systems and minor asteroid mining operations provide the equivalent of a Stipend of 1200 GP or 24,000 Dollars / Credits per month to work with (12 CP). The armories and stores thus start off with a net value of 12,000 GP or 240,000 Dollars / Credits – enough to keep even Cable thinking that he has enough guns. Reconstruction: Shapeshift with Elemental Forms and Variants, Specialized / only to take on station forms suited to the environment and modify it’s internal layout (6 CP). Graymalkin is usually a space station, but it can be a floating island, a massive aerial platform, or an installation, and can add, remove, or modify it’s rooms and layout pretty much at will. Given that changing to an appropriate form covers all the environmental stuff, positioning thrusters, and similar details, we’re basically only interested in the stuff that’s relevant to characters working there or breaking in. Cloaking: Specialized for Increased Effect (Graymalkin simply blends into it’s environment, and so can take the form of a massive orbiting base without attracting global attention) / this blurring effect does not work against observers who are reasonably nearby. A ship which comes within a thousand miles or so will – if looking – be able to detect the presence of Graymalkin and its cargo or occupants fairly readily (6 CP). Physical Structure: Note that the various Rooms are considered Specialized for half cost; they don’t yield downtime earnings; they simply provide facilities for the characters/crew. Thanks to Graymalkins shapeshifting abilities, the various rooms adjust as needed. Armory (Two, 390 GP). There are plenty of guns, armor, and station-defense missiles available. Bridge (Guard Post, 160 GP), Actually Professor pretty much runs the place, but there are some relatively clunky manual controls here if anyone wants to use them. Cells (Two, 180 GP). These are reasonably restraining, but any serious metahuman will require additional measures. Cerametal Plating (Hardness 30 hull and external doors, 2500 GP). Danger Room (Dojo, 155 GP) What with internal shapeshifting, this provides the usual highly-realistic combat simulations – and is reinforced with the cerametal plating just in case. Dock (160 GP). Depending on Graymalkin’s current form thse may be spacedocks, facilities for planes or boats, or whatever. Galley (Kitchen, 80 GP). Actually most food and drinks are obtained via “Purchasing”, but some people do like to do their own cooking. Hydroponics (Two Greenhouses, 300 GP). Laboratories (Two, 390 GP), Thanks to Shapeshifting, these will work for almost any relevant skill. Lodging (215 GP). Crew / Agent quarters. Medical Bay (Infirmary, 185 GP). Meditation Room (Sanctum, 95 GP). Multimedia Library (230 GP). In a modern setting this is a general +2 to relevant skills as well as an entertainment center. Observation Dome (220 GP). The Professor has something of a hobby in astronomy. Watch out if he asks you to deliver a package; by now it may be his fourth or fifth pass through any specific year, and he occasionally meddles by mail. Portal Generator (Escape Route, 180 GP). It’s hard to say where you’ll wind up if you use this, but Graymalkin DOES use a gate-generating system as it’s main drive. Wherever you wind up is usually better than being aboard a failing space station though. Sitting Room (240 GP). The common areas are pretty nice. Water Recycling (Reservoir System, 200 GP). Workshops (Three, 540 GP). Thanks to Shapeshifting, these will work for almost any relevant skill. Graymalkin has its limitations, but it’s still a base of operations capable of traversing space, time, and dimension and supporting a small rebellion anywhere it goes. That’s a pretty good base for almost any group. BAB: +6, Corrupted/Does not provide iterative attacks (24 CP). Hit Dice: 8 (L1d8, 4 CP) +32 (L2-8d6, 14 CP) +24 (Ring of Oak) +60 (Con Mod x 12) +96 (Str Mod x 12) = 220. Mutants & Masterminds: Toughness 16. Proficiencies: Proficient with all Simple, Martial, and Exotic Weapons (15 CP). Armor Class: 10 (Base) +10 (Armor) +5 (Nat) +6 (Dex) = 31 (32 in Melee). Ranged: +12 (+6 BAB +6 Dex), Damage varies. 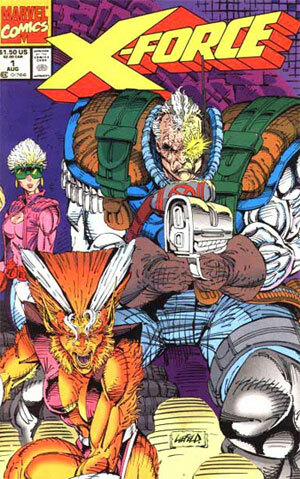 Cable may be equipped with virtually anything from the d20 future books with the option to maximize the damage. In most cases, 3d8 to 3d12, with missile launchers inflicting up to 8d6. (Mutants & Masterminds: generally +7 to +13). This comes to a total of 272 CP. Minor Four-Color Abilities: Stabilize (Cable always stabilizes when dying) and Air Bubble (Cable can hold his breath an unreasonably long time). As an eighth level character, Cable can carry around 33,000 GP – or 660,000 credits or dollars – worth of gear. Feet: Great Big Boots (Vanguard Treads, 3100 GP): Cable ignores difficult or slippery terrain and gets +8 to resist Bull Rushes and +4 to resist grappling attempts to move him into another square. Tool Belt: Travelers Anytool (250 GP). Regeneration Stimulator (Rod of Bodily Restoration, 3100 GP). That leaves 25,000 GP – or 500,000 Credits / Dollars – worth of gear. In general, that’s enough to let him carry all the guns, explosives, missile launchers, and minor military gear (as a casual time traveler, he’s free to shop at any progress level) that he could possibly want – and given that he doesn’t use external armor, doesn’t usually bother with a vehicle when he can “Bodyslide” (Teleport), and doesn’t need a lot else except clothes… Cable has no reason NOT to carry a small mountain of weaponry. The usual rule for d20 is that levels 1-2 are for normal people, level three is for highly-trained experts, elite military types, brilliant scientists, and so on. levels four and five are for pulp heroes, levels 6-10 are for superheroes, levels 11-15 are for demigods, and level 16+ is for classical gods – but throwing the Superheroic World Template (free mana for everyone, every round!) into play upgrades everything by at least one rank – putting Cable into the high-end superhero/minor god range. A very impressive representation! The way you’ve put the various aspects of his character together is really something to see (I never quite realized how cheap d20 Future materials were in terms of GP), though given that he can expend mana every single round, it seems like he’d virtually always make sure he maximized his attacks or rolled a 20 to hit, etc. Also, I noticed that Greymalkin only seems to have 24 CP worth of abilities, despite being allotted 36 due to its corruption. Why thank you! He was pretty elaborate – but, as usual, there turned out to be a viewpoint from which he made some kind of sense. His was harder to find than most characters though. And I would expect him to spend his two extra Mana every round – it’s just that he has to make some choices. Spend it attacking? Save it to ignore a condition, make a save, or buy off damage? take an extra action because he’s up against a swarm of opponents? So many useful applications, so little Mana… he basically has a tactical minigame to play each round there. And I see where Greymalkin went wrong! I forgot to insert the 12 CP cost of it having it’s own stipend (on top of the Professors). Thank you for pointing it out, I shall insert the cost. Wait… Why does he have bonus feats every other level? Isn’t that only a thing for low item games? Ah, that one’s easy; Pathfinder Package Deal, Pathfinder Skill List, Pathfinder downtime rules for Graymalkin… Pathfinder Feat Progression.